Hood Tech Corp., Vision Inc. 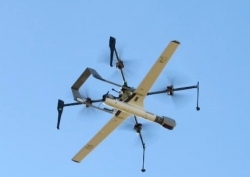 Hood River, OR, March 21, 2019 --(PR.com)-- Originally sized with comfortable margin when handling a 25kg ScanEagle, Hood Tech has recently extended the capacity of its Flying Launch and Recovery System (FLARES) to handle aircraft weighing up to 45kg. This capacity includes all existing ScanEagle/ScanEagle3 variants. Click here to view the list of recent Press Releases from Hood Tech Corp., Vision Inc.